Last week I got a call from a friend I hadn’t seen in a while asking me to substitute in her Bunco group that Friday. Because I haven’t been in my new community very long I don’t know a lot of people yet. So even though my friend lives on the other side of St. Louis (about an hour drive from me) I was flattered she’d thought of me and I readily agreed to join in. Of course if I had been thinking of my history, I might not have been so eager. In May of 1885, Joseph Ramsden arrived in New York on vacation from Manchester, England. A successful businessman, Ramsden set out to explore the city and was delighted when just a day into his vacation he was recognized on the street. A gentleman claiming to be the nephew of the captain of the ship Ramsden had recently arrived on, told the flattered businessman that the captain had spoken well of him. The new acquaintance, himself a successful manufacturer of women’s undergarments, offered Ramsden a guided tour of Broadway. The two found they had a lot to talk about (I’m guessing mainly women’s undergarments) and Ramsden (unwisely) agreed to accompany the captain’s nephew into a small second-floor office where he claimed he needed to buy a train ticket. As the man dug around in his bag for the money he used to pay the ticket salesmen, he also pulled out items necessary to his business (perhaps samples of women’s undergarments?) to show a fascinated Ramsden. Then at the bottom of the bag, the man happened to discover that he also had a deck of cards. Logically, he showed his latest and greatest card trick to a suitably impressed Ramsden and ticket-salesman. So the next step was for the ticket salesmen to ask the two new friends if they knew how to play three-card monte, a popular gambling game of the time, sometimes played with a combination of cards and dice. Ramsden (wisely for once) declined the ticket salesman’s invitation to play the game, which prompted the salesman to suggest that perhaps Ramsden didn’t have enough money to play (he may have also called him a chicken). Still Ramsden was (again, wisely) reluctant to play, but as his pride was at stake he (alas, unwisely) took ₤50 from his pocket to prove his worth. That’s when Ramsden’s new acquaintance (who it turned out was neither the captain’s nephew nor a manufacturer of women’s undergarments) snatched the money and ran. Ramsden pursued the man to no avail and when he returned to the ticket office, he found only an abandoned room. 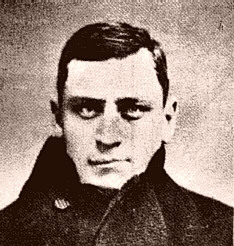 Joseph Ramsden had been swindled by one of the most famous bunko men of the age, variously known as William Howard, John Astorhouse, Henry Post, Louis Alcaser, Charles Clayton, and most often as “Hungry Joe” Lewis. And Ramsden was in good company with military and political leader John A. Logan and poet and writer Oscar Wilde, both also bunkoed by Hungry Joe. The game of bunko as it’s played today descended from a game called 8-dice cloth that was a popular social pastime in 18th century England. 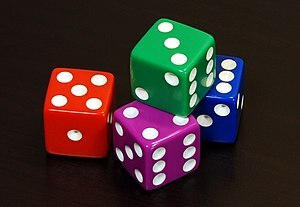 When the simple dice game arrived in the United States in the 1850’s, it had become a swindler’s game. At first referred to as Banko, the simple dice game merged with the Spanish card game “Banca” (called Monte in Mexico) and became a vehicle for elaborate set-ups designed to swindle money from gullible marks. It wasn’t long until “bunko” came to refer to any con designed by a “bunko man” and perpetrated on the gullible who found themselves “bunkoed.”Seedy Bunko parlors sprang up all over the nation in the late 19th century and were resurrected in the speakeasies of Prohibition. Bunko men were common and city police departments maintained regular bunko squads to counter the problem. But even though the bunko of today is essentially a game of chance, it really is more of a social outlet for (primarily) busy ladies (“bunko babes”) who for one night a month can pay $5 to leave their husbands in charge of the kiddos and enjoy a margarita with other busy ladies. If they are the big winner they may even get to take home a kitschy prize. I am happy to report that my friend has never claimed to be a manufacturer of women’s undergarments (apparently an untrustworthy group of folks) and the invitation I received to play bunko wasn’t an elaborate set-up. I was not, however, the lucky winner when I played. After stringing together more than a dozen low scores in a row, I guess you could say I lost my shirt. But Bunko has become a much friendlier game over the years. My spectacular loss meant that I went home with a prize, too. Actually as a substitute, I didn’t even have to pay $5 for dues. I think my friend’s group may have been bunkoed.